Lethbridge Sick's Brewery, view of the beer bottle assembly line. Courtesy the Galt Museum & Archives: P19752209038. I have a bottle I am having trouble identifying. It is green, held 10 ounces of beer (I assume) and looks more like a soda pop bottle than a beer bottle. It has Lethbridge printed on one side. The other side is the number 6, with the word Sicks over the six. The molding seam goes from he bottom up through the lip of the bottle. The lower part has vertical ribs. Have you seen anything like this, or do you know where I can do further research? The Lethbridge Sicks "6" Brewery began its soft drink line in the early 1900s, producing under the Orange Crush franchise and its own Lethbridge label. The line helped sustain the brewery through periods of prohibition and bans on advertising alcoholic beverages. In 1965, soft drink operations were sold to 7-Up Lethbridge Bottling Limited. Jack Lakie, Brewery General Manager, stated that the sale was made in order to focus the plant's production on making beer, which had always been the Brewery's main interest. The sale, however, was was more likely the result of the government's discontinuation of a ban on the advertisement of alcohol. Sicks' ginger ale subtly promoted the Brewery's Lethbridge Beer label in a marketing strategy known as shadow advertising. The Lethbridge Dry Ginger Ale logo was almost identical to that of Lethbridge Beer, thus, advancing the sale of beer through the advertisement of pop. 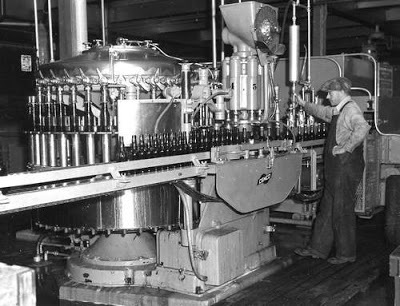 The last bottle of Lethbridge Ginger Ale was produced on 24 February, 1966 at 11:30am. The bottle’s age dates to the 1950s or 60s – no later than 1966. The Brewery was in operation from 1901 to 1990. Molsons Brewery bought the Brewery from the Sick family in 1959. Do you have an object you have questions about? Post it here, and we will do our best to answer!